Automatic Bollards employ a simple yet efficient electro-hydraulic mechanism ensuring smooth and efficient movement of the bollard. Designed to be a very secure product in preventing unauthorised access, they are often used in conjunction with automatic barriers. The bollard is installed into the ground and brought level with the road surface. They are controlled by a small control panel which has integrated safety features. A manual override facility ensures the bollard can be lowered in the event of an emergency or power failure. The TP7276H Automatic Bollard is built for performance and has been intensively tested for over 3000 manoeuvres per day. The bollard is controlled by a CDS dedicated control unit, which is capable of controlling up to 4 bollards simultaneously and includes a ‘deceleration feature’ at the end of travel when opening and closing. For added safety the bollard is fitted with an obstacle detection sensor that stops and lowers the bollard if an obstacle is detected. A crown of LED lights is mounted on the top of the cylinder with a built-in acoustic warning signal. The bollard casing is completely independent from the motor allowing it to be pre-installed prior to ground work completion. 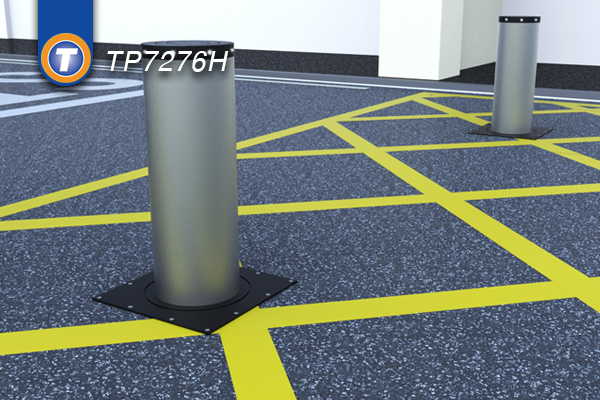 The TP7276H Automatic Bollard can be easily integrated with access control and safety equipment, traffic lights, photocells and ground loops. The bollard casing is completely independent from the motor allowing it to be pre-installed prior to ground work completion.